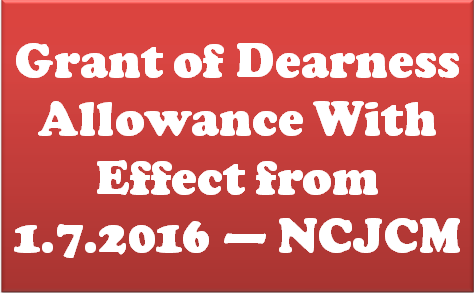 Subject: Grant of Dearness Allowance With effect from 1.7.2016 — Reg. 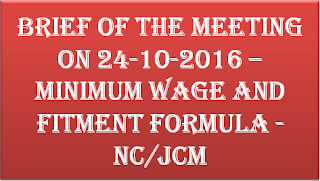 We refer to our letter of even No.NC/JCM/2016 dated September 6, 2016 wherein we have requested for an amendment to the existing formula of DA computation, necessitated by the revision of Pay with effect from 01.01.2016. We hope that you must have caused the matter to be examined. 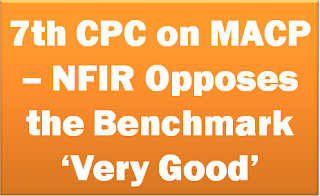 We are prepared to call on the officer concerned, if there is any ambiguity in our contention. Since the normal date for issuance of DA order was in September, we shall he grateful if a decision in the matter is taken urgently. 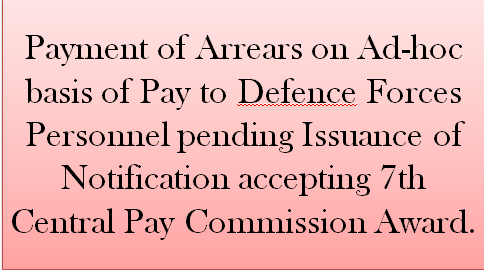 Payment of Arrears on Ad-hoc basis of Pay to Defence Forces Personnel pending Issuance of Notification accepting 7th Central Pay Commission Award. 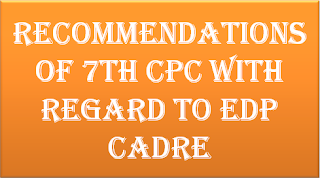 The 7th Central Pay Commission (CPC) recommended a slab based system for determining the disability pension for Defence Forces Personnel, which was accepted by the Government. 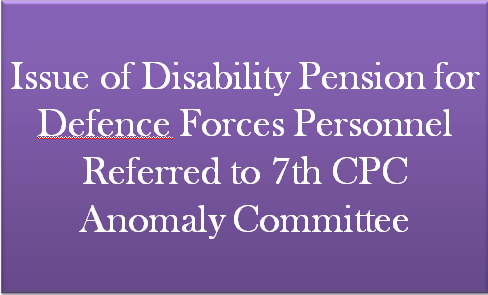 Percentage based system was followed in the 6th CPC regime for calculating disability pension for Defence Forces Personnel as well as Civilians. 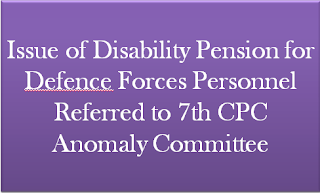 Service Headquarters have represented that the percentage based system should be continued under the 7th CPC for calculating disability pension for Defence Services at par with their Civilian counterparts. The Ministry has referred the representation of the Service Headquarters to the Anomaly Committee of 7th CPC for consideration. 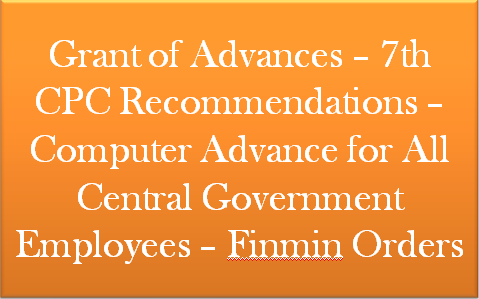 Subject: Grant of advances – Seventh Pay Commission recommendations – Amendment to Rules 21(5) of Compendium of Rules on Advances to Government Servants. 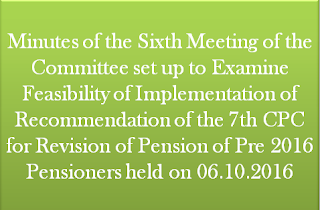 The undersigned is directed to say that in of the decision taken by the Government on the Seventh Pay Commission’s recommendations relating to advances, the existing provisions of Compendium of Rules on Advances – 21(5) relating to Personal Computer Advance are amended as per the amendments attached. its attached and subordinate offices for their information. 3. The PLB will be paid to all eligible Gp.’B’ (Non-Gazetted), Gp. ‘C’ & Gp. 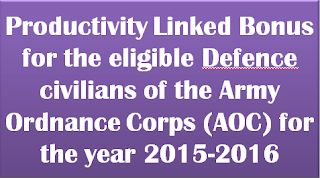 ‘D’ civilian employees of AOC who are covered under PLB Scheme for the accounting year 2015-2016. The calculation ceiling of Rs.7000/-(7000×40/30.4) and other terms and conditions of the PLB Scheme will remain unchanged. 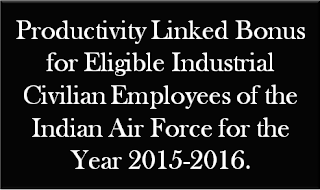 Productivity Linked Bonus for Eligible Industrial Civilian Employees of the Indian Air Force for the Year 2015-2016. 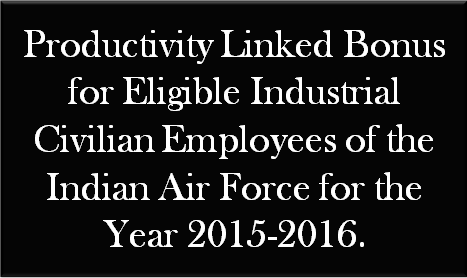 Subject: Productivity Linked Bonus for eligible industrial civilian employees of the Indian Air Force for the year 2015-2016. 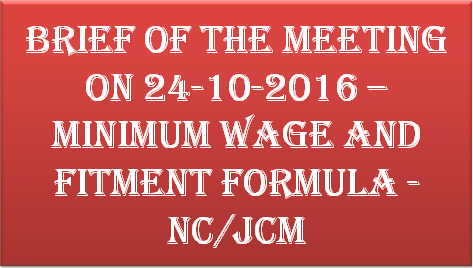 2 The entitlement has been worked out on the basis of the working results for the year 2015-2016 in accordance with the agreed formula. 3. The PLB will be paid to all eligible Gp. ‘B'(Non-Gazetted), Gp. ‘C’ and Gp. 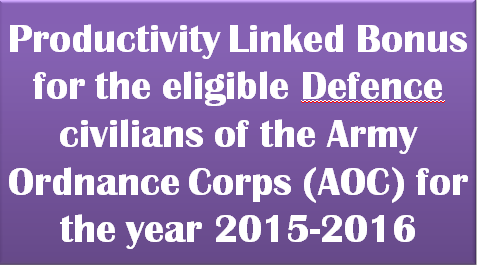 ‘D’ civilian employees of Indian Air Force who are covered under PLB Scheme for the accounting year 2015-2016. The calculation ceiling of Rs.7000/-(7000×40/30.4) and other terms and conditions of the PLB Scheme will remain unchanged. 4. Productivity Linked Bonus to the casual labouer will be paid at the assumed wages of Rs. 1200/- for the accounting year 2015-2016. However, in cases where the actual wages fall below Rs. 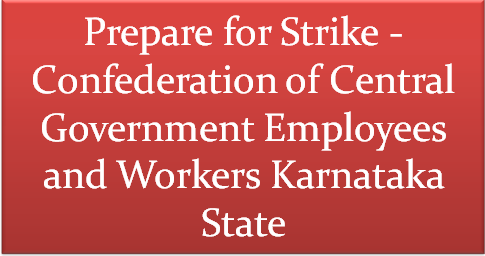 1200/- p.m., the amount will be calculated on the actual monthly wages. The other conditions remain unchanged. 6. This issues with the concurrence of the Ministry of Finance (Deptt. of Expenditure) vide their ID No.300308319/e-III(A)/2016 dated 05.10.2016 and MOD (Finance/AG/PB) vide their Dy. 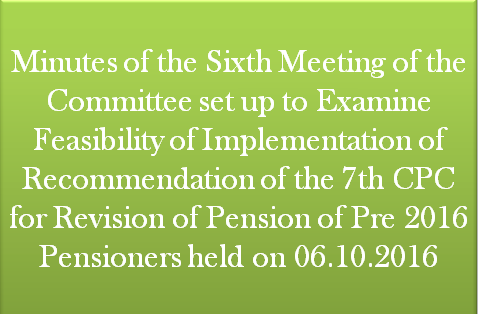 No.194/AG/PB dated 5.10.2016. 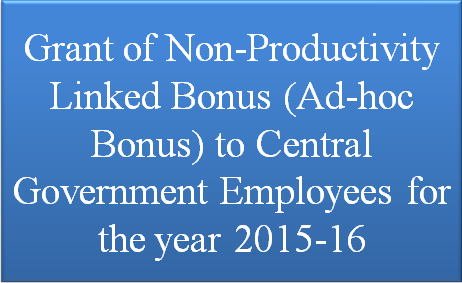 Subject: Grant of Non-Productivity Linked Bonus (ad-hoc bonus) to Central Government Employees for the year 2015-16. 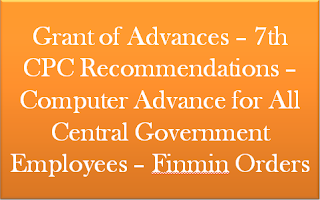 The undersigned is directed to convey the sanction of the President to the grant of Non-Productivity Linked Bonus (Ad-hoc Bonus) equivalent to 30 days emoluments for the accounting year 2015-16 to the Central Government employees in Groups ‘C’ and ‘D’ and all non-gazetted employees in Group ‘B’, who are not covered by any Productivity Linked Bonus Scheme. 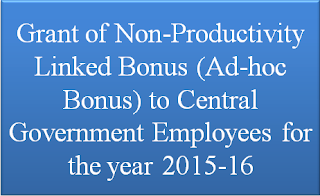 The calculation ceiling for payment of ad-hoc Bonus under these orders shall be monthly emoluments of Rs. 7000/-, as revised w.e.f 01/04/2014 vide OM No.7/4/2014-E.III(A), dated 29th August, 2016. 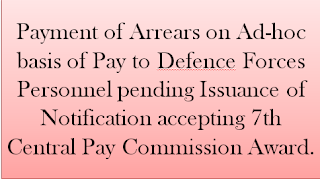 The payment of ad-hoc Bonus under these orders will also be admissible to the eligible employees of Central Para Military Forces and Armed Forces. 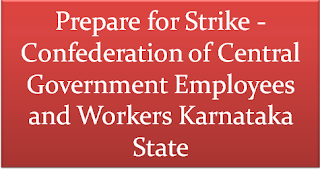 The orders will be deemed to be extended to the employees of Union Territory Administration which follow the Central Government pattern of emoluments and are not covered by any other bonus or ex-gratia scheme. 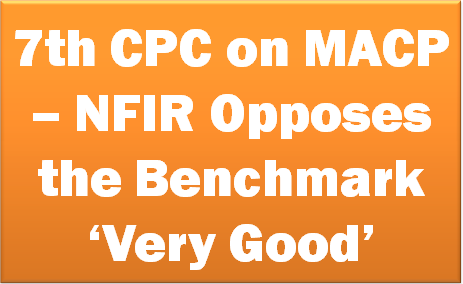 (ii) The quantum of Non-PLB (ad-hoc bonus) will be worked out on the basis of average emoluments/calculation ceiling whichever is lower. To calculate NonPLB (Ad-hoc bonus) for one day, the average emoluments in a year will be divided by 30.4 (average number of days in a month). This will, thereafter, be multiplied by the number of days of bonus granted. To illustrate, taking the calculation ceiling of monthly emoluments of Rs. 7000 (where actual average emoluments exceed Rs. 7000), Non-PLB (Ad-hoc Bonus) for thirty days would work out to Rs. 7000×30/30.4=Rs.6907.89 (rounded off to Rs.6908/-). (iii) The casual labour who have worked in offices following a 6 days week for at least 240 days for each year for 3 years or more (206 days in each year for 3 years or more in the case of offices observing 5 day week), will be eligible for this Non-PLB (Ad-hoc Bonus) Payment. 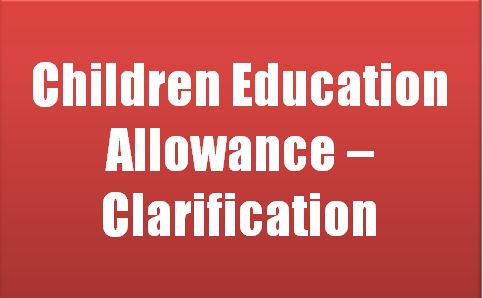 The amount of Non-PLB (ad-hoc bonus) payable will be (Rs.1200×30/30.4 i.e.Rs.1184.21 (rounded off to Rs.1184/-). In cases where the actual emoluments fall below RS.1200/- p.m., the amount will be calculated on actual monthly emoluments. (v) The clarificatory orders issued vide this Ministry’s OM No.F.14 (10)-E.Coord/88 dated 4.10.1988, as amended from time to time, would hold good. 3. The expenditure on this account will be debilable to the respective Heads to which the pay and allowances of these employees are debited. 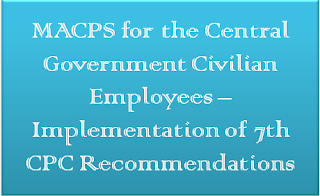 Modified Assured Career Progression Scheme (MACPS) for the Central Government Civilian Employees – Implementation of Seventh CPC Recommendations. 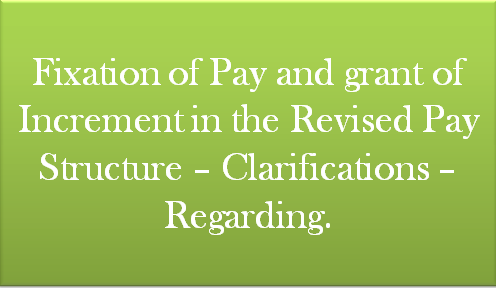 Fixation of Pay and grant of Increment in the Revised Pay Structure – Clarifications – Regarding. 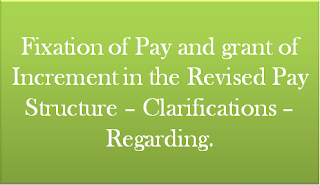 Subject: Fixation of pay and grant of increment in the revised pay structure – clarifications – regarding. 1. Point of doubt: As per the provisions of FR22 (l) (a) (1), the Government servants (other than those appointed on deputation to ex-cadre post or ad hoc basis or on direct recruitment basis) have the option, to be exercised within one month from the date of promotion, to have the pay fixed under this rule from the date of such promotion/ appointment or from the date of next increment. 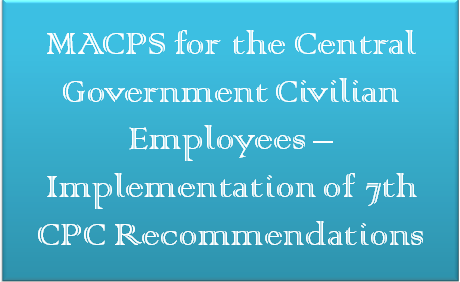 Some of the employees, promoted between 01.01.2016 and the date of notification of CCS (RP) Rules, 2016 had opted for their pay fixation on promotion/financial up-gradation under MACPS from the date of their next increment in the lower grade. Consequent upon notification of CCS (RP) Rules, 2016 i.e. 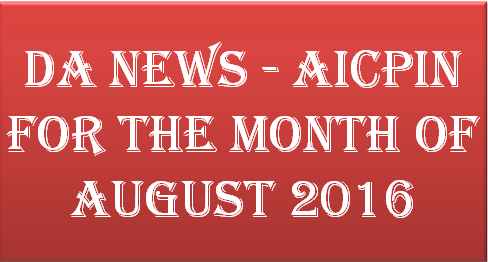 25th July, 2016, the option submitted by such employees has now turned out to be disadvantageous. Whether such employee may be allowed to revise their option under FR 22 at this stage. 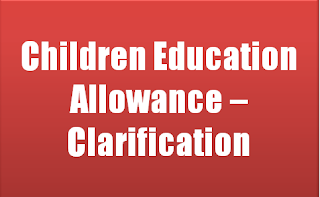 Clarification: Under the changed circumstances after notification of CCS (RP) Rules, 2016, the employee may be allowed to exercise revised option for fixation of pay under FR22(l)(a)(1), Such revised option shall be exercised within one month of issue of this 0M. Option so revised, shall be final. 2. 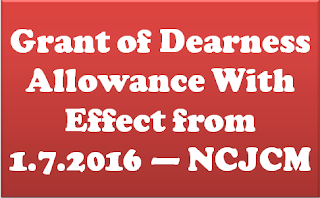 Point of doubt: Whether employees appointed/promoted/ during granted financial up-gradation 02.01.2015 and 01.07.2015 will be entitled to grant of one increment on 01.01.2016,. 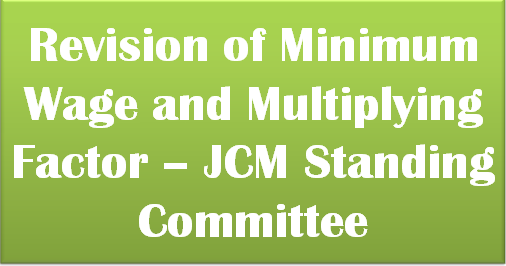 Clarification: Since the provisions of CCS (RP)Rules, 2016 are effective from 01.01.2016, no increment shall be allowed on 01.01.2016 at the time of fixation of pay in the revised pay structure.